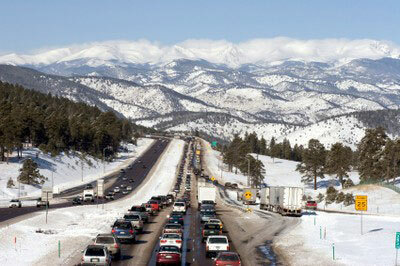 The I-70 Mountain corridor is the gateway to the Rocky Mountains from the Denver Metro area. It offers breathtaking views, access to unique and historic mountain communities, and rich natural heritage and resources. The corridor serves as a recreational destination for the world, a route for interstate and local commerce, and a unique place to live and play. I-70 is also federally designated as a high priority corridor, a significant part of the defense network, a major east/west continental corridor, and a major economic corridor for Colorado. For many local communities along the corridor, I-70 is the lifeline, primary access, and only connection to other communities. Current I-70 roadway geometry is constrained with narrow shoulders and tight curves that impact safety, mobility, accessibility, and capacity for travelers and residents. CDR has been working with the Colorado Department of Transportation (CDOT) in partnership with local jurisdictions, landowners, and a variety of stakeholders along the I-70 corridor, to implement a Context Sensitive Solutions (CSS) process that will result in solutions to improve the westbound highway and the communities along the road. The goal is to develop transportation solutions that respect the unique environmental, historic, community, and recreational resources in the study area. Additionally, improvements are needed to lessen delays caused by peak period volumes. Preliminary options have been developed during the Concept Development Process, and will now be moved forward in the National Environmental Policy Act (NEPA) process and toward implementation over the next few years. As the process transitions into NEPA, CDR Associates will continue facilitating and engaging a diverse stakeholder group – from county representatives, recreational rafting and cycling groups, US Forest Service, businesses and residents. Our goal is to provide a forum to effectively develop and communicate a shared vision and goals for the corridor that will safely and efficiently move people and freight while respecting and prioritizing the communities, ecosystems, and wildlife.